between | take your marks. go. One of the nice things about being in Auckland is the number of friends from my travels that have been ‘popping in’ while I’ve been here. There’s something quite exciting about meeting someone out of situ and makes brunch even more exciting. This week, Claire messaged me saying she was in Auckland for a few days, and naturally I wasn’t going to pass up the chance to test out some place new for brunch. 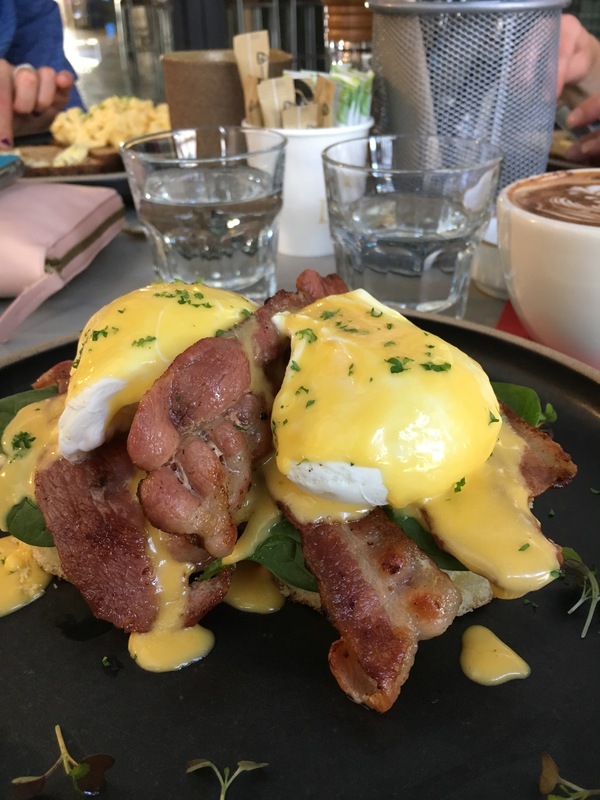 I’ve borrowed a few of my photos from Urban List as my phone died soon after I got to Between Cafe & Eatery – I just had enough battery to pay for my food (I’d also left my card at home, total face palm moment) and get a few blurry snaps of brunch. Unfortunately I was really underwhelmed by Between. It’s had rave reviews online and Claire had been there before and really enjoyed it, but from start to finish everything was a little…average. Writing this now, looking back on my notes, I’m finding it hard to recall anything specific about the place (other than the tiles), with everything blending in to general nothingness. The first niggle I had was just how hard it was to find! Nestled between a row of blue shops, perhaps they thought the bright white facade would stand out, but with just a small sign in the window, blending in to the interior, it was only as I crossed over and walked past that I realised I had reached my destination. I loved the tiles in the entrance, and as I walked into the cafe I was reminded of countless other coffee stops in Vietnam and Cambodia: the same French-Asian styling, I loved the contrast of grey and white. The rest of the cafe was quite minimal, with an almost warehouse feel there are live vines growing along inside trellace and the high ceilings give the illusion of huge space. The distressed interior makes you feel you’ve stumbled along a hidden gem. We had the place to ourselves first thing in the morning and I excitedly opened the menu, held together with twine and a sprig of fresh rosemary threaded through. After scanning and finding Eggs Benedict (with bacon and spinach, no less) I knew what I’d be going for my usual and eagerly ordered a skinny mocha and benny. I don’t remember if there was music playing, I do remember seeing one of the baristas fiddling with a phone near some speakers, so there must have been, but the atmosphere just felt a bit flat. The mocha was the only redeeming part of this brunch. It was rich and creamy, tasting almost like it had been made with real chocolate, not powder or syrup. The texture of the milk was smooth, perfectly stretched and almost velvety, it felt good in my mouth. My velvety mocha: the saucer and spoon were super cute: unfortunately my phone died before I could get a snap of the spoon. I couldn’t taste the coffee though. It could have done with an extra shot, or a darker hit to really compliment the chocolate milk and I was disappointed not to have that satisfying contract of sweet and bitter that I love from my mochas. It was served in a mug, and I really like the carved bone spoon and curved wooden saucer. 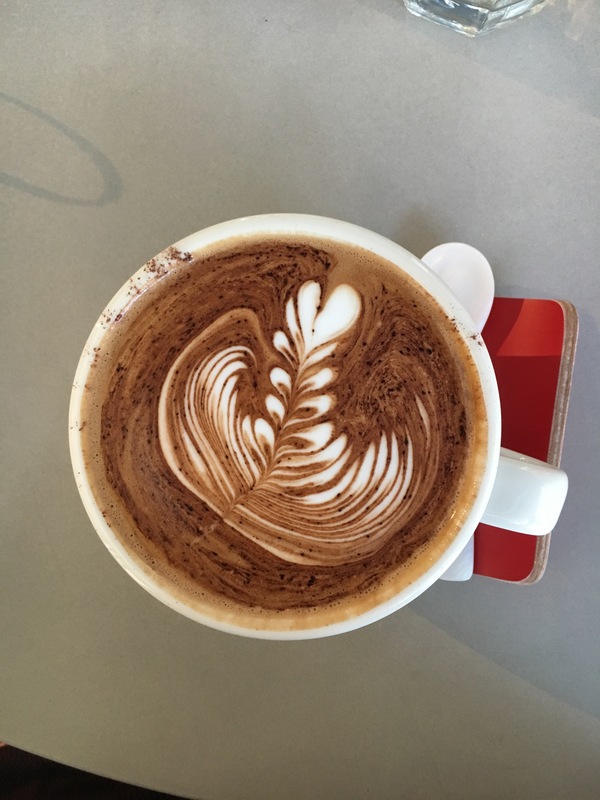 Aesthetically it looked great, and it was a pleasure to drink: the milk was a good temperature when the mocha was served, staying warm throughout my brunch. Again, it looked great, and the food came out really quickly. 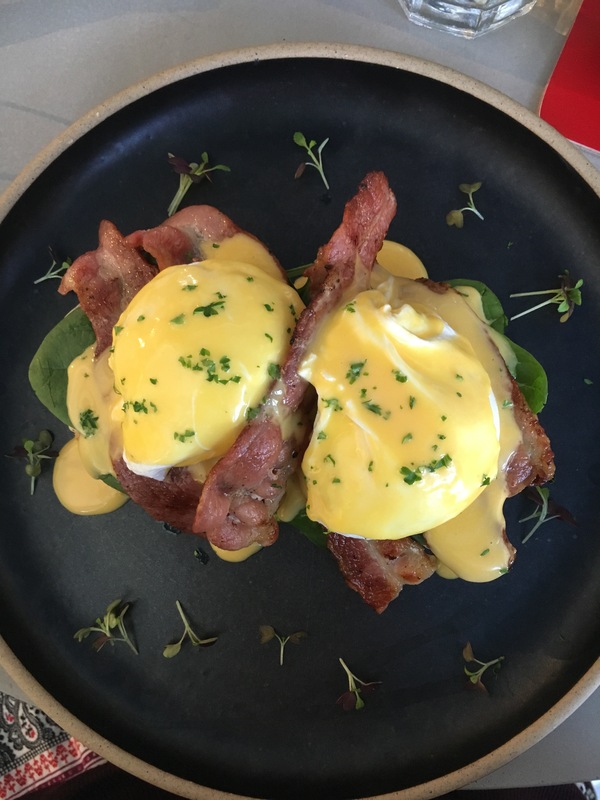 The presentation was beautiful and it was aesthetically pleasing, but the bacon and hollandaise were nearly cold and the eggs were under cooked, it was a kit meal that had been nearly entirely pre-prepared and thrown together to order while the eggs were poached. A slightly blurry snap, but I was impressed with the presentation, and I did actually really like the plates. I’m not a complete idiot, I understand how hospitality works, and I know there is always an element of preparation: you want everything to run as smoothly and quickly as possible, but the speed with with the meal came out made me feel like it had just been pulled out of the chiller, warmed through and sent out. There were two rounds of bread on the plate, it took almost until the end of the meal to work out what was wrong with them, but they hadn’t been toasted. Usually I like my toast on the rare side, still a little soft and ‘bread-y’, but it didn’t seem there had been any effort to toast here. The yolks were runny, which we all know is a huge tick for me, but the whites were runny too, which is an instant turn off. The eggs needed just a minute longer to be perfect and I ended up leaving most of the whites, unable to get the bogey like egg down. I’ve been racking my brains and pulling on my taste buds trying to think of something to comment on the hollandaise, but I’m drawing a blank. It was hollandaise, but, like everything else at Between it was sort of nondescript; nothing stood out for me with the sauce, good or bad. I can’t say anything bad about Between Cafe & Eatery (aside from the lack of signage), but I also can’t say anything great about it either. As far as fueling me for the day goes it did the job, but I wouldn’t rush back. The staff were really friendly and I did love those tiles (have I mentioned the tiles?! ), there were nice touches with the fresh rosemary nestled in the menu binding and the fresh foliage and big front windows certainly gave you that inside/outside feel. Honestly? I don’t know what all the fuss is about. I’ve had significantly better brunches in Auckland alone, let alone on my world wide brunch quest.